Cute mice, and very Christmasy, but making them can be a pain in the back. I love to make Christmas cookies, the more intricate the better. But by the time I’ve measured, shaped and cut a shallow groove into 66 shortbreads, I can feel a burning pain between my shoulder blades, a pain so strong that I have to stop what I’m doing and take care of it. 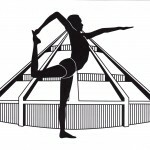 It would be lovely if yoga could prevent the pain. It doesn’t. But it has taught me what to do about it. Take it slow. Ground your sitting bones, lift on the inhalations and turn on the exhalations. If time is extremely short, then I’ll twist in a chair, a Five-Minute Yoga Challenge from a year or so ago. It’s a simple twist, but surprisingly effective. To make it work, you have to sit down and truly immerse yourself in your body. Slow down, stop thinking about anything else, and walk yourself into the twist, step by step. Set a timer for two minutes on each side – you’ll be surprised how long that can be. Then follow the basic rules of the twist: first elongate your spine, then twist. And keep your chin in line with the centre of your sternum. 1. Lie down on the floor with your legs up the wall. Make sure your whole back is settled on the floor. 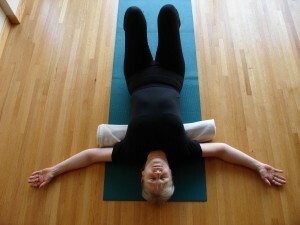 Then with every exhalation, breath out through your back into the floor. Stay for two to three minutes. 2. With your knees together, slide your feet down the wall. Gently draw your knees toward your chest. You’ll feel your lower back soften and stretch even more. 3. Come away from the wall and do a soft supine bent-knee twist (Jathara Parivartanasana). Lie down on your back with your arms at shoulder height. Bring your knees to your chest. Keep the inner knees touching. If they don’t touch, put a chip foam block between your knees. Now exhale and aim your knees at your right shoulder. Keep your left shoulder on the floor, and the left side of your ribcage resisting away from your knees. Have a bolster or blocks nearby to put under your thighs as you turn. When you come to the first limit of your twist, rest your thighs on the support, and stretch away through the left rib cage and arm. Stay and breathe until you feel some release. Change sides. Check that your shoulders are being tugged away from your ears and your lower back is long before you straighten your legs. 4. Stretch backwards over a rolled up blanket, a bolster or bricks. Whatever chest opening you choose, make sure it’s comfortable from the beginning, but gives you room to go deeper when your upper back releases. One way to do that: place a chip foam block or blocks under your head when you first come into the chest opening. 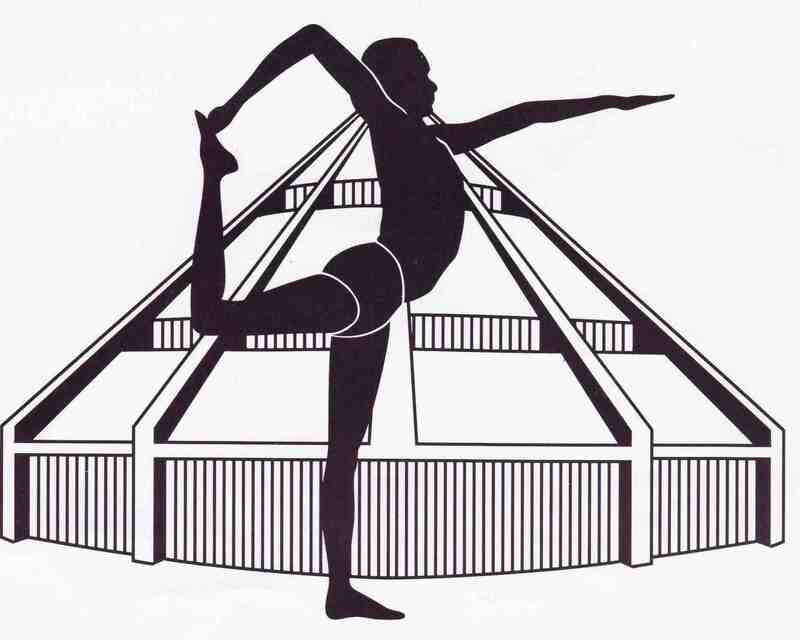 Then, as your spine stretches, take some or all of the height away. Make sure you feel the stretch in your upper back, and that your lower back stays long. Extend your buttocks towards your heels. 5. Repeat the supine bent-knee twist (3). Keep it soft. Work to lengthen your thoracic spine in child's pose. 6. Child’s pose. Sit on your mat, big toes together, knees apart, buttocks resting on your heels. Keeping your buttocks as close to your heels as possible, walk your arms forward. As your buttocks and thighs continue to move back, elongate the sides of your chest forward. For added chest opening put yoga bricks under your hands. 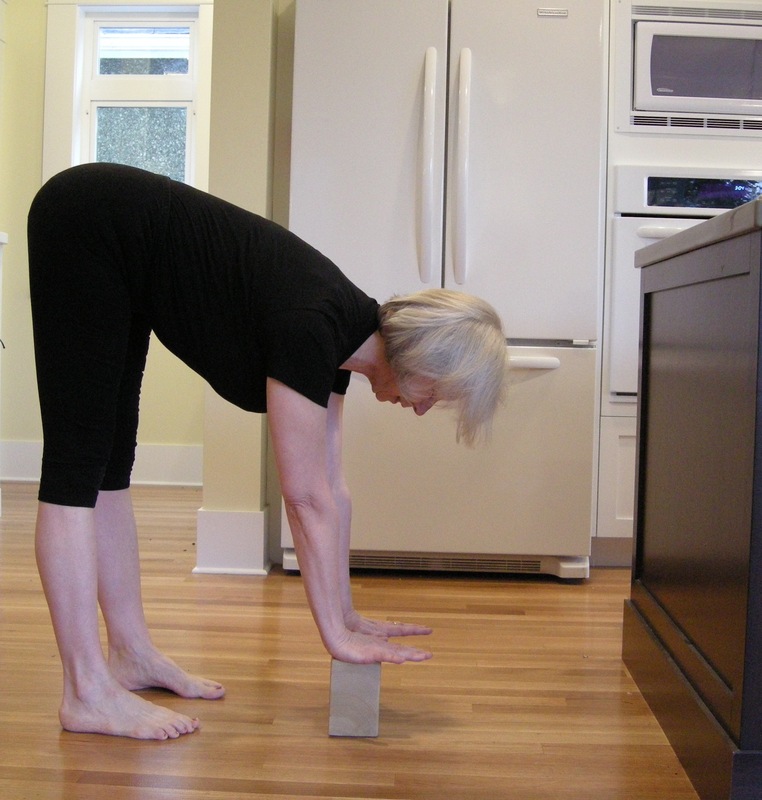 Press down into the bricks, pull your upper arm bones back toward your shoulders, and stretch your spine forward. 7. From child’s pose, come to kneeling and press up into downward facing dog pose. In the pose, lift your forearms away from the floor, and press your back ribs deeper into your chest to increase the opening of your upper back. 8. Walk your feet forward and your hands back into standing forward bend (Uttanasana). Have your feet as wide as the mat, heels separated so no mat color shows along the outer edge of your foot. Use bricks – or whatever else you might need – under your hands so your legs can be straight. Press down through your outer arches and your inner heels. Lift your inner ankles and your kneecaps. Roll your front thighs toward the centre, your back thighs toward your outer legs. Let your upper body elongate toward the floor. Stay for a minute or two, then bring your hands to your thighs, press in and swing up. Then it’s back to the baking, or wherever else your holidaymaking takes you. I plan to take a Christmas break. Next week, I’ll be too absorbed by the project of making a Christmas bombe with my nephews to write anything coherent about yoga. And the week after, if memory serves, I’ll be in the beached whale days, digesting, reflecting, and wanting only to curl up with a good book and a cup of tea. In the meantime, I’ll be announcing winners of the Priority Matrix apps on Facebook, and musing about plans for the new year, including a collection of all of the Five-Minute Yoga Challenges in one handy ebook. I wish you all a happy holiday, and a new year filled with the light of yoga. As for the wonderful stretches you suggest, what do you think about using a rolled mat for the supine backbend? I love the firmness of a mat over a blanket or bolster (although I often teach with the latter, definitely if students are beginners). My spine needs that “stronger” reminder of where to bend and release! I hope you enjoyed some R&R over the holidays, amid the cookie dough and Xmas bombes! Bundt cakes sound good. I’ve never tried silicone bundt pans, or silicone anything, so thanks for the recommendation. 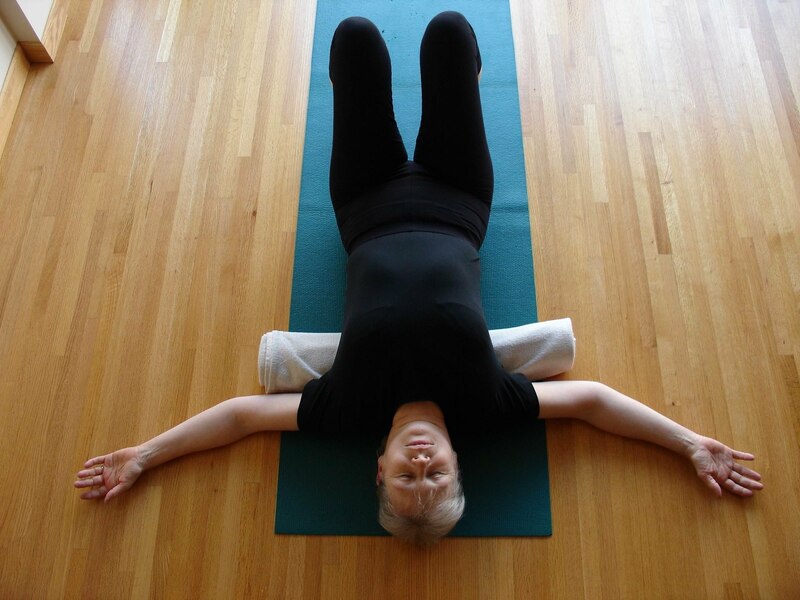 I love using a rolled mat for supine backbend. Sometimes on the floor, sometimes on a layer of chip foams if I want to feel something bigger. I also love lying on a vertical rolled up sticky, and doing reclining mountain pose. For beginners I prefer a blanket over a bolster for the very first chest opener because it saves me running around the room adding chip foam blocks to support tight shoulders. I’m not a baker, but a carpenter has just as much need for back-ease stretches. Your post was very timely, after loading 140 4′ x 8′ sheets of plywood into the shop! Thanks also for the cappuccino shortbread cookies, which are so easy, even I can make them successfully. My children were impressed. All the best for the holidays, Eve, and see you in the New Year. I can only imagine how sore you could be after loading all that plywood! Yikes. So glad the cappuccino shortbreads work for you. And happy holidays to you too. I don’t go quite as complex as you on the cookie making but I have some recipes that can make my back tired so I either take everything to a table or — my favorite–sit on the floor. Requires much less fixing with yoga. But I love the legs up the wall stuff– have a little at-the-wall series I give all my students for lots of good stretches in lots of chakras in a little bit of time and I always like to add pieces like this. Thanks. I’ve never tried the floor, but when i think of it I do sit down at the table, which works well. I’ve been considering getting a stool for the kitchen, so I can sit at the chopping block. Legs up the wall has to be one of yoga’s great gifts to humankind. My teacher Wende used to start every class in legs up the wall – perfect for dropping the day and slowing down. Best of the holidays to you. I can’t find the link for cappucino shortbread – it sounds fantastic! I was worried about that. The link is fine, but you have to scroll down the page to find the recipe. This recipe is from Five Star Food, my first cookbook with the Vancouver Sun, published in 1993. Finely crush the instant coffee in a coffee grinder. In a large bowl, cream together the butter and sugar. Beat in instant coffee and vanilla. Sift flour and cornstarch together, stir into the butter mixture. 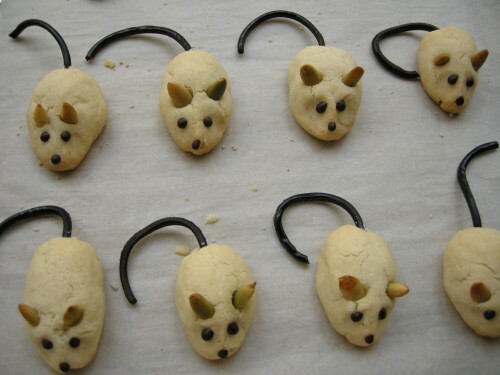 Mould into the shape of coffee beans, using one tablespoon (15 mL) of dough for each cookie. Using the back of a knife, press an indent about 1/8-inch (2.5-mm) deep, lengthwise, across the top of each cookie. Place on a greased baking sheet. Bake at 325 F (160 C) for 15 minutes. Place on wire racks to cool. Dip either one end or both ends of the cookies in chocolate. Place on baking sheet lined with wax paper and refrigerate. Happy Holidays, Eve. 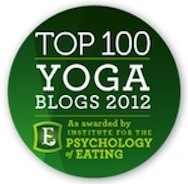 I always enjoy your fine writing first on food and now on yoga, and sometimes on both. How lucky we all are to have these joys in our life. Happy and joyful holidays to you too, Judie. It really is a magical time of year.